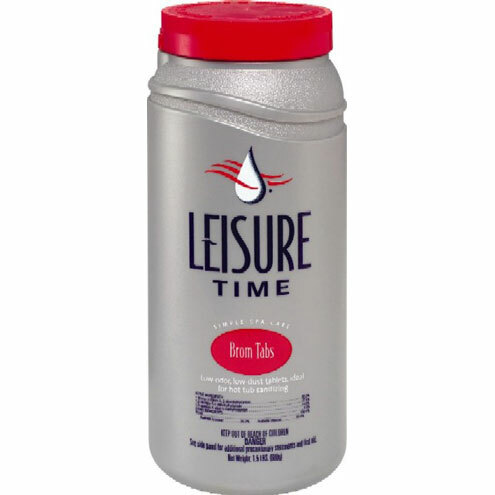 Chemicals > Spa Chemicals by Brand > Leisure Time > Bromine- Tabs 1"
· Contain 10% more active sanitizer than BCDMH. · Brom Tabs are 2.5 times more soluble than BCDMH which is ideal for floating spa feeders. · Creates a faster bromine residual for spa startup. · Brom Tabs utilize Dantabrom chemistry which creates a better dissolution rate in a floating feeder. Before using this product in your spa or hot tub for the first time, add 1/2 ounce of sodium bromide per 100 gallons of water to establish a 30 ppm bromide concentration. Also, add sodium bromide at this dosage whenever the spa or hot tub is drained and refilled. The bromide addition ensures immediate establishment of an all-bromide system, eliminates chlorinous odors and maximizes skin and eye comfort. Using a suitable feeder adjusted according to the manufacturer's directions, add this product to maintain an active bromine concentration of 2 to 4 ppm in residential spas and 3 - 6 ppm in commercial spas. Use a reliable test kit to monitor bromine regularly. This product's usage will typically vary from 0.015 to 0.10 pound for every 300 gallons of spa water to maintain the recommended bromine concentration range. The presence of organic debris, high bather use and other factors may require a higher dosage. Water soluble, non-filerable wastes can accumulate in spa water and cause dull or cloudy water and can stimulate algal growth. Superoxidation or superchlorination with a suitable oxidizing shock treatment should be done on a regular basis to remove these wastes and maintaing clear, sparkling water. Suitable oxidizing agents are those based on calcium hypochlorite, lithium hypochlorite, sodium hypochlorite or potassium peroxymonoperfulfate. Do not mix this product in concentrated form with any other chemicals. Do not add otehr chemicals to the feeding device when using this product.